Good textbook programs have all the right components--a complete TOC, a consistent and engaging authorial voice, a solid feature set, a supporting set of ancillaries. But what makes a textbook program great, is when all of those components play off each other to form a larger composition--when the whole is greater than the sum of its parts. Connections, by Gore, Leuwerke, & Metz is one of the great ones. A rep once asked me where was “growth mindset” covered in Connections. It’s in there, of course. The index will give a page number or two. But the real answer? It’s everywhere. For starters, it’s in the cover. If a fixed mindset is like thinking an acorn will grow into a bigger acorn, then this cover is growth mindset. Like both the first-year students using this book and Connections itself--this tree is blossoming, expanding, coming into its prime. It’s also in the inside front cover. ACES: the only student self-assessment truly grounded in positive psychology. Whereas other assessments are designed to extrapolate out whether a student will fail or pass based on a set of multiple choice questions, ACES is designed to reveal to students their inner assets, and in the case of their growth areas--their "not-yet" inner assets. At the start of each chapter, students get in the habit of reflecting on their ACES strengths, and setting goals to better develop/utilize that skill. It’s in the Voices of Experience feature. When Connections first launched, I was a field representative for Macmillan Learning, and I found these students and employees talking about their experience a bit tepid compared to the student profiles found in other texts. Where was all the drama and conflict? It wasn’t until I came in house as an editor that I understood the pedagogical reason for this choice--these profiles, of actual students, are designed to provide positive modeling, a research-backed strategy for improving resilience. Growth mindset is also in the digital LearningCurve formative assessment for each chapter. LearningCurve does a lot of things--helps with memory and retention, connects students to the eBook, etc.--but its most powerful benefit might be how it provides students with positive reinforcement as they develop their strengths. Finally, it’s in the Personal Success Plan. I’m not sure I’ve ever seen two textbook features work as powerfully together as ACES and the Personal Success Plan. The PSP is the scaffolded goal setting activity, but you can’t set goals without a starting point. ACES is the starting point, the self-awareness, the diagnostic. In ACES you get your Point A so that in the PSP you can make a plan to get to Point B. The tagline of ACES comes from this exact interplay: Know your strengths, grow with goals. I sometimes hear that all textbooks are the same, that all publishers are the same, that anyone can assemble components into a Blackboard shell. But the more time I spend with Connections, the more I am enthralled by its greatness--and the more that I am convinced that those “assemblages” must be merely pretending. 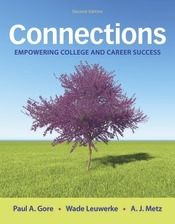 Connections, Second Edition, publishes this fall, with a full LaunchPad, including LearningCurve, ACES, and the full eBook at only $60 retail to students. For those on a tighter budget, Connections Essentials is available for $40 retail to students--LaunchPad Solo + eBook. This great book available, in a full course solution, for as little as $32 net/$40 retail.